Do you ever get so busy and think you just simply don’t have time to workout? We all enter those especially busy seasons of our lives; it’s inevitable. It’s important to decide that no matter what season of life you’re in, you will make yourself and your health a priority! Personally, I’m in a busy season of life right now- trying to juggle wedding planning, helping take care of my two future step-kids whom I adore, work, spending time with family and friends…and I’m still supposed to find time to workout 5-6 times a week like I’m used to?! Working out is my stress reliever, and I feel so much better when I take the time to do it. What I’m learning is that it doesn’t always have to be an hour a day. I’ve started doing some 30- minute specialty classes, and they are so great for busy schedules! In and out in 30 minutes-what more could you ask for?! I’m loving the Hit30 classes-a 30-minute high intensity workout that gets you sweating and burning calories in no time! Even 30 minutes a day gives me more energy and an overall better feeling throughout my day. Don’t let lack of time cause you to give up your workout for the day. When you take care of your body, you will have more energy to put into the people and things in your life. Your health is not an option; it’s a necessity! 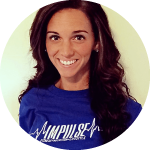 Kristin is a certified personal trainer thru AFAA (Aerobics & Fitness Association of America) and is currently pursuing a Bachelor’s degree in Exercise Science at Kent State University. She has a passion for helping people believe in themselves and overcome any self-doubt or fear of failure that stands in their way of getting into the gym. She wants to help you become confident in yourself through exercise and healthy eating so that you can feel your best and live your life to the fullest.